I always like to have more than less which is why I like to invest in a portable grill on top of having a nice normal sized grill. Now I know I have reviewed a couple in the past, and it really comes down to personal preference and what kind of features you are looking for in a grill. This review is of Coleman’s Fold N Go grills. While not the absolutely best out there it is quite good for the money and has great features to boot. I’m sure you know who Coleman is – there is no need for introduction. Coleman has been around for a long time and I myself knew them as the cooler company who stands by the quality of the product they produce and make sure these are really worth it for the people. They have ventured off into making quality, compact, and portable grills at very competitive prices. These Fold N Go’s are no exception, they are really quite great little grills. 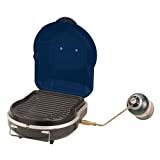 This maybe something to be considered for those intending to buy an additional portable grill or maybe just a cheap, small, and portable grill you can use anytime and will take a lot less time and mess to clean up. I would recommend buying these portable grills if you live in an apartment or if you have a small family. These grills can really be an ideal cooking partner for you. There are 2 kinds of Coleman Fold n Go Gas Grills which are really similar to each other. These 2 grills are basically the same thing except that the Fold N Go InstaStart grill features an InstaStart matchless technology helping you start it faster so you can use it immediately. Both of these grills can actually fold smaller than a briefcase and both of them are very lightweight. These grills have a 105 sq. inches of total cooking area. The great thing about these grills is that despite the size you can actually cook about 3-4 hamburgers at the same time effortlessly and it actually heats up very fast and you can cook pretty fast with it. Though I should tell you to be careful, as the flames on both these Fold N Gos are actually blue and sometimes hard to see. Even at the lowest setting where it may look like its not working, don’t be fooled as it can get very hot. I suggest you take some time and cook at the lowest setting till you get used to it. Another great feature of these grills is the PerfectFlow pressure control system that helps keep the heat steady and PerfectHeat Technology design for maximum performance. They both also feature a fully adjustable, 6,000 BTU, stainless steel, horeshoe-shaped single burner that provides even heat distribution. As mentioned previously, these grills are ideal for those who don’t have a lot of room but still want a grill to use. Similarly, they are also ideal for those who like to go on camping trips, tailgating, fishing trips, even beach trips – really ideal for bringing to the outdoors as it’s not that heavy nor does it take too big a space. The truth is there really isn’t much of a difference between these two grills, it’s just a matter of liking the InstaStart button better or lighting it up the old fashioned way. And the InstaStart model comes in a vibrant red color while the normal model comes in a blue color. If you do buy any of these unit, be sure to always clean it afterwards in order to maintain it properly, as it is sheet metal and it might rust quite easily. Oh and did I mention the grill grates and grease pan are actually dishwasher safe. Now ain’t that dandy! Now, although there were a couple of consumers who said they have had a problem with a very sharp edge on the silver drip pan at the bottom of the grill, I don’t think it’s on every grill as only a number actually pointed it out but just to be on the safe side you should thouroughly check your grill just in case it has that. You can get the Fold N Go InstaStart model on Amazon for only $60.29 and it also rated a 4.1 stars out of 5. While the other Fold N Go model is available on Amazon for only $61.38 which got a rating of 3.7 out of 5 stars. I personally prefer the InstaStart model as it takes away the hassle of lighting it up and you can start grilling in no time. FOIL BAKED CORN ON THE COB12 ears fresh cornSEASONED BUTTER:1/2 c. butter1/2 tsp. saltPreheat oven to 450 deeegrs or prepare coals in grill.Remove husks and silk from corn just before cooking; rinse ears. Spread seasoned butter on corn and place each ear on a piece of heavy aluminum foil. Wrap securely. Bake or grill 4-6 inches above glowing coals 20-25 minutes.Other seasonings you may want to try for the seasoned butter are:****************Oven Baked BBQ RibsRibs of your choicePre heat oven to 325Place ribs on cookie sheet or pan wrap in foil (easier to clean afterwards)Seasoned ribs with your desired seasoningCook 30 minutes and turnSeasoned with your desired seasoningCook 30 minutes and turnBrush on Honey bd to 1 cupCook 30 minutes and turnBrush on Honey bd to 1 cupCook 30 minutes and turnBrush on BBQ sauce of your choiceCook 30 minutes and turnBrush on BBQ sauce of your choiceSlice and serve….. Never no leftovers!As far as how much it will cost will depend on how many people will becoming to your bbq.